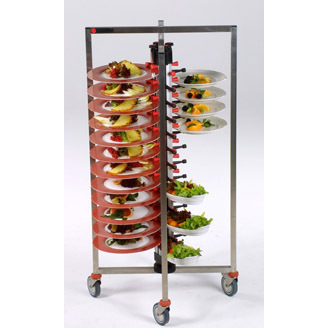 The 84-plate mobile plate jack, our collapsible plate tree is a folding plate stand mobile trolley that can be hung on a wall or put in a corner for storage. 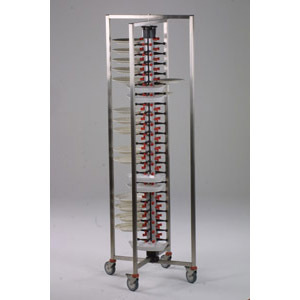 You can save space twice with this plate rack, first when in use with up to 84 plates and then when not in use. Made of stainless steel tubes, it requires no maintenance. Cleaning can be done with a high-pressure washer or with a brush and soap suds. A protective cover for the PM84-135 plate cart is available as an optional item to protect against odors and to prevent the dish contents from drying out. 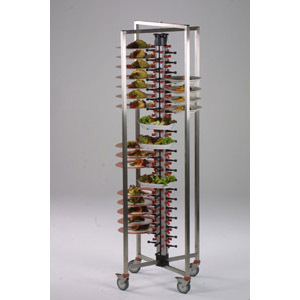 Our 84 plate mobile kitchen racks adjust to fit nearly any plate size. If used properly you can tilt our 84 plate trolleys up to a 20 degree angle, fully loaded, without dropping a plate. 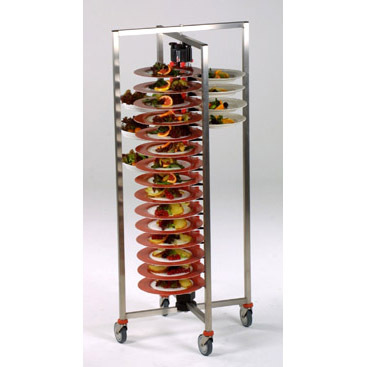 Our mobile plate racks are made from stainless steel and fully tested in professional kitchens throughout the USA. All castered, or wheeled carts are shipped skidded via LTL freight at freight class 250 using NMFC#188950-01 and are non-stackable freight.